Charlotte's trees provide buffers from noise and pollution​. Pollution and noise from busy roadways and rail lines can create unhealthy and undesirable conditions for those living nearby. The American Lung Association has found “growing evidence that vehicle emissions coming directly from those highways may be higher than in the community as a whole, increasing the risk of harm to people who live or work near busy roads” (ALA 2015). Charlotte has a number of heavily-trafficked state and county roads bisecting the city, especially Billy Graham Parkway, Brookshire Boulevard, Wilkinson Boulevard, U.S. 77, U.S. 485, and U.S. 85. Much of the city has at least one major road cutting through the fabric of the community. Buffers of trees reduce both noise and pollution. A 100-foot-wide, 45-foot high densely-planted tree buffer can reduce highway noise by 50% (North Carolina State 2012). The City of Charlotte, TreesCharlotte and North Carolina Department of Transportation are working together to plant loblolly pine seedlings along portions of I-485 at the request of neighborhoods to help combat highway noise. 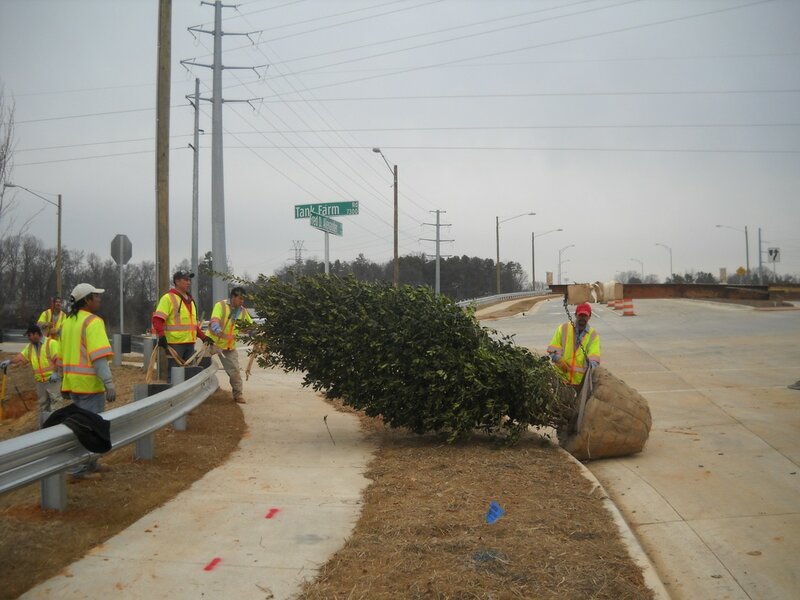 Streets being planted along Tank Farm Rd and Fred D. Alexander Blvd. "Reduced noise makes the city overall a more attractive place to live"
​"Provide screening from commercial properties in mixed use residential neighborhoods." "Wilmore is littered with (taller than usual) utility poles that crisscross the neighborhood on all streets. The trees also provide beauty and mask the ugliness of the utility poles." ​A 100-foot-wide, 45-foot high, densely-planted tree buffer can reduce highway noise by 50% (North Carolina State 2012).